Austrian author; born Oct. 25, 1848, in the Russian government of Podolia. His childhood was spent at Czortkow, Galicia, the "Barnow" of his stories. Franzos attended the German gymnasium at Czernowitz and studied law at the universities of Gratz and Vienna. After passing the state examination he devoted himself to journalism, and traveled (1872-76) through Europe, Russia, the countries of the Danube, Turkey, Asia Minor, and Egypt. In 1877 he settled in Vienna, and published as the fruit of his travels "Aus Halb-Asien" (Leipsic, 1876; 4th ed., Berlin, 1900), "Vom Don zur Donau" (Leipsic, 1878; 2d ed., 1890), and "Aus der Grossen Ebene" (Stuttgart, 1888). In these three books, which have been translated into many European languages, he gives brilliant sketches of the social conditions of the countries he visited. From 1882 to 1885 he edited the "Neue Illustrirte Zeitung," and in 1886 founded the "Deutsche Dichtung," which he edited himself. In 1887 he moved to Berlin. Franzos' childhood was spent in a Jewish-Polish village, surrounded by the narrowness of Orthodox Galician Judaism. His father had seen German life and received a German education. Returning to Galicia as a district physician, he became a benefactor to his poor countrymen, who, although they loved and admired him as their physician, stood aloof from him, unable to understand how he, one of themselves, could dispense with regulations which for them were religion. 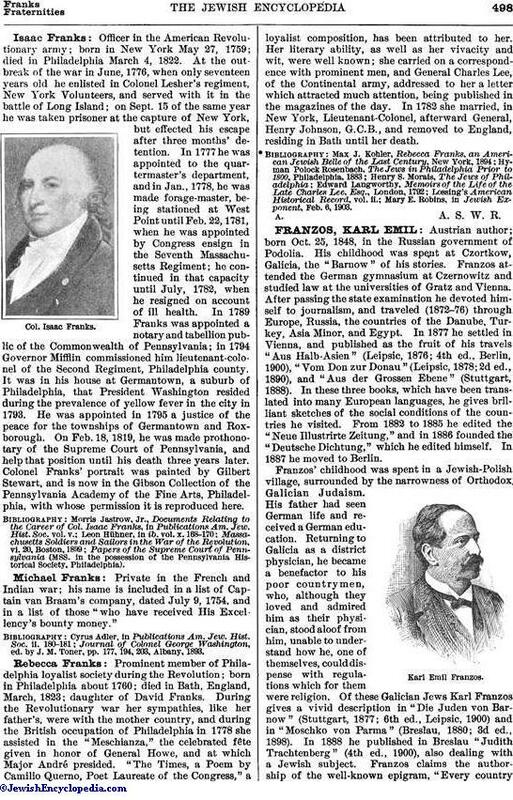 Of these Galician Jews Karl Franzos gives a vivid description in "Die Juden von Barnow " (Stuttgart, 1877; 6th ed., Leipsic, 1900) and in "Moschko von Parma" (Breslau, 1880; 3d ed., 1898). 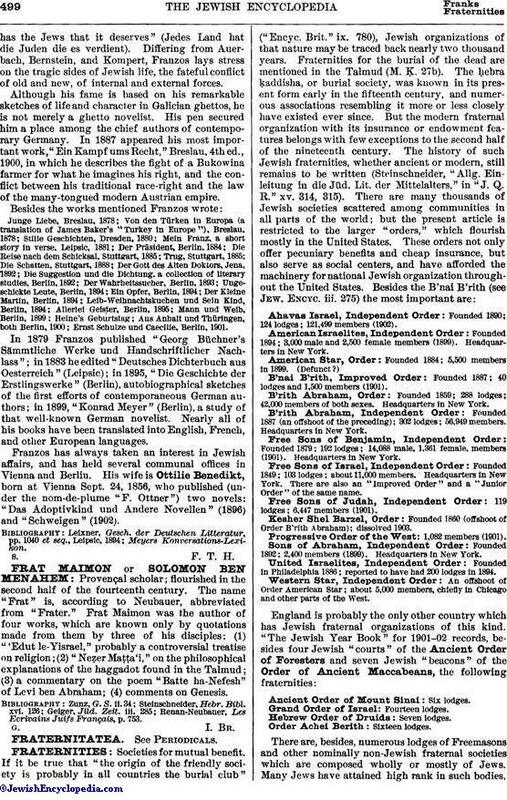 In 1888 he published in Breslau "Judith Trachtenberg" (4th ed., 1900), also dealing with a Jewish subject. Franzos claims the authorship of the well-known epigram, "Every countryhas the Jews that it deserves" (Jedes Land hat die Juden die es verdient). Differing from Auerbach, Bernstein, and Kompert, Franzos lays stress on the tragic sides of Jewish life, the fateful conflict of old and new, of internal and external forces. Although his fame is based on his remarkable sketches of life and character in Galician ghettos, he is not merely a ghetto novelist. His pen secured him a place among the chief authors of contemporary Germany. In 1887 appeared his most important work, "Ein Kampf ums Recht," Breslau, 4th ed., 1900, in which he describes the fight of a Bukowina farmer for what he imagines his right, and the conflict between his traditional race-right and the law of the many-tongued modern Austrian empire. Ernst Schulze und Caecilie, Berlin, 1901. In 1879 Franzos published "Georg Büchner's Sämintliche Werke und Handschriftlicher Nachlass"; in 1883 he edited "Deutsches Dichterbuch aus Oesterreich" (Leipsic); in 1895, "Die Geschichte der Erstlingswerke " (Berlin), autobiographical sketches of the first efforts of contemporaneous German authors; in 1899, "Konrad Meyer" (Berlin), a study of that well-known German novelist. Nearly all of his books have been translated into English, French, and other European languages. Franzos has always taken an interest in Jewish affairs, and has held several communal offices in Vienna and Berlin. His wife is Ottilie Benedikt, born at Vienna Sept. 24, 1856, who published (under the nom-de-plume "F. Ottner") two novels: "Das Adoptivkind und Andere Novellen" (1896) and "Schweigen" (1902).